Perhaps you’ve already heard the news. 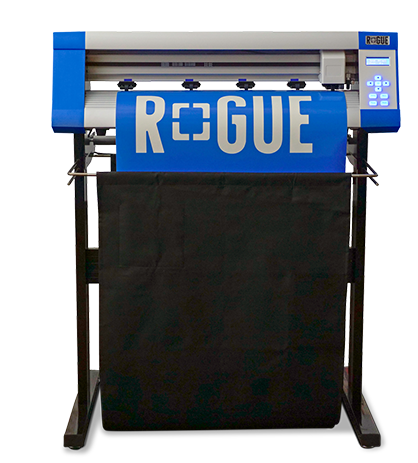 We have an exciting new line of Vinyl Express sign cutters called the Rogue Series. The Vinyl Express Rogue Series resets expectations for crafters, small sign shops and even commercial and industrial sign makers. The Rogue Series contour cutting vinyl cutters raise the bar in features, performance, and value. The Rogue Series consists of three models that offer features like automatic registration mark sensors, enhanced tracking, and superior speed, force and precision. The Vinyl Express Rogue will enable you to take your projects farther than ever. 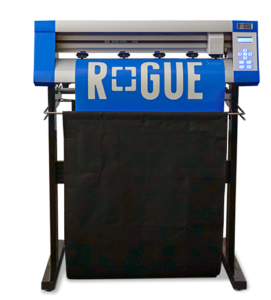 The Rogue offers new capabilities for crafters, new levels of utility for signs and banners, even a new way to purchase your cutter. It’s time to elevate your expectations and break free. Come take a look. The Vinyl Express Rogue Series is designed for crafters and aspiring signmakers who want to take their personal and hobby decals to the next level. Break free from the prison of costly fonts and templates. Upgrade from your Cricut or Silhouette with a full size 24″ cutter ideal for decorating drinkware, creating T-shirt transfers, car window decals, stencils, wall graphics, laptop decals, and much more. Best of all, it comes with ARMS. That’s a laser-based automatic registration mark sensor for contour-cutting printed graphics. This is an affordable cutter you can pair with your desktop inkjet printer for custom printed T-shirt transfers or couple with a large format solvent inkjet printer for durable full color decals. The Rogue comes with a floor stand and cuts at up to 31.5 inches per second with up to 300 grams of force. That’s more than enough force to handle all your vinyl and stencil projects, and heat transfer films, including bling and glitter. You can cut wood stencils and even glass etch stencils. The Rogue is versatile but simple, affordable, and easy to use. Yet it’s bigger, faster, and more capable than any craft cutter. And it’s powered by LXI 12 software. The Rogue even helps you break free from pre-made bundles. You choose the software and supplies. LXI software comes in five levels from Apprentice to LXI RIP 12. LXI Apprentice is the perfect bridge program for designing in CorelDRAW, Illustrator, or other graphic design applications. LXI imports all standard vector file formats including .svg files. Choose Expert, Master or Master Plus and equip yourself with a full design suite of powerful creative tools for all kinds of vector graphics. You say you want to add a supplies starter kit for T-shirts? Configure it for signs & banners? Go bare bones and add more supplies later? The new Rogue online interface empowers your choices. The Rogue starts at only $599 with LXI Apprentice 12 software. The Rogue Plus adds a digital servo motor for quieter operation and more precise cutting of small, intricate designs. You also get increased production speed. This is a cutter made for professional quality signs, banners, and decals. The digital servo motor also enhances tracking so you can reliably produce vinyl jobs up to 18 feet long. The Rogue Plus is a 24″ cutter and stand that cuts at speeds up to 39ips for more productivity. It cuts at up to 400 grams of force, and also includes advanced laser mark sensing firmware that supports precise contour-cutting of single or multiple decals. The Rogue Plus is the perfect upgrade for those with an entry-level cutter looking for something quieter, more precise and more capable. The Rogue Plus starts at $995.00 with LXI Apprentice. The Rogue Pro is a game changer. It comes loaded for bear with five pinch rollers and up to 750 grams of force! That’s more than enough cutting power to handle 35 mil sandblast stencil film for monument work and diamond grade prismatic reflective vinyl for highway signage. The laser contour cutting firmware is further enhanced with a smart segmented registration mark option. This supports precise cutting of large batches of printed decals. The Rogue Pro is faster, stronger, and smarter than anything else in its class. And it comes with a canvas basket to keep your long vinyl jobs clean and pristine. 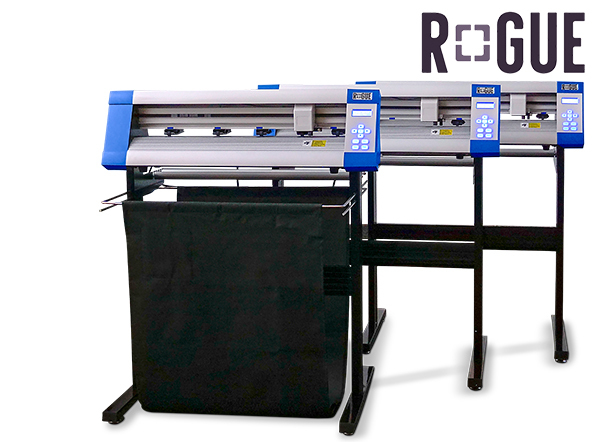 The Rogue Pro is a 24″ cutter with five pinch rollers, a floor stand and vinyl basket, and two roller bars. It cuts at up to 39ips and up to 750 grams of force. The Rogue Pro also adds a multiple mark option and excellent tracking performance. If you’re ready to upgrade your signs, shirts or graphics business, or looking for a more capable cutter for your industrial applications, this is the cutter for you. The Rogue Pro starts at only $1,299 with LXI Apprentice. If you’re looking for something bigger, faster and more capable for your craft and hobby graphics… something quieter and more precise for your small sign shop… or a better vinyl cutting solution for your commercial or industrial vinyl business, you’re in the right place at the right time. It’s time to break free. It’s time for a Vinyl Express Rogue Series cutter. Start here.